Today is Winter Solstice, a traditional Chinese festival. 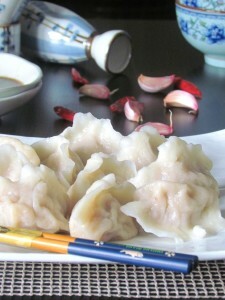 It is one of my favorite festivals during the year, because we are going to have dumplings for today! Dumplings are the most essential and popular food for Winter Solstice, especially in northern China. There is a legend that Zhang Zhongjing, a renowned medical scientist at the end of Eastern Han Dynasty (25 – 220), found his fellow-townsman suffering from coldness and hunger when he returned from his position of prefecture chief in winter. More severely, many of them had terrible chilblains in the ears. On the Winter Solstice day, he cooked food named Jiao Er with a stuffing of medicine and other ingredients fending off the cold to feed these people, and they recovered soon. 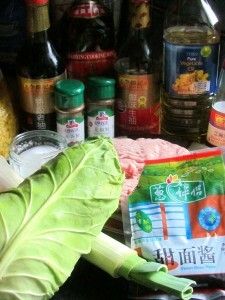 Later people learned to make the food to create the present dumplings. Meanwhile, the saying that one’s ears will be frozen if he doesn’t have dumplings on the Winter Solstice was widespread till today. 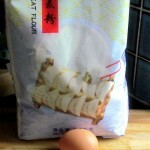 Put the flour in a big bowl, crack the egg in it, add 1 and 1/2 cup of cold water and stir until it forms a soft dough. Cover the bowl with a damp cloth and let it sit for about 30 minutes. 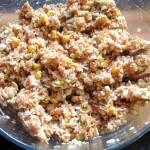 Put the minced pork and all the seasoning ingredients except salt in a big bowl, stir in one direction until it becomes a paste. 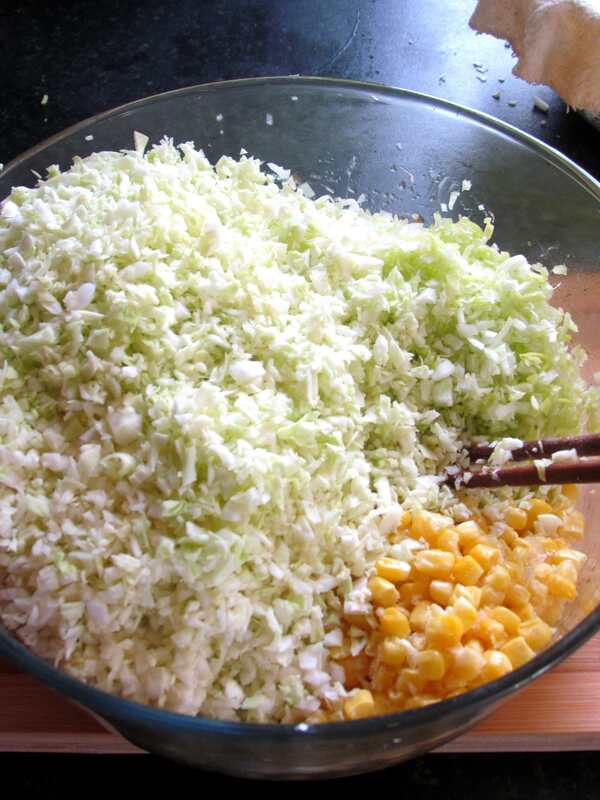 Finely chop the leek and sweet heart cabbage. 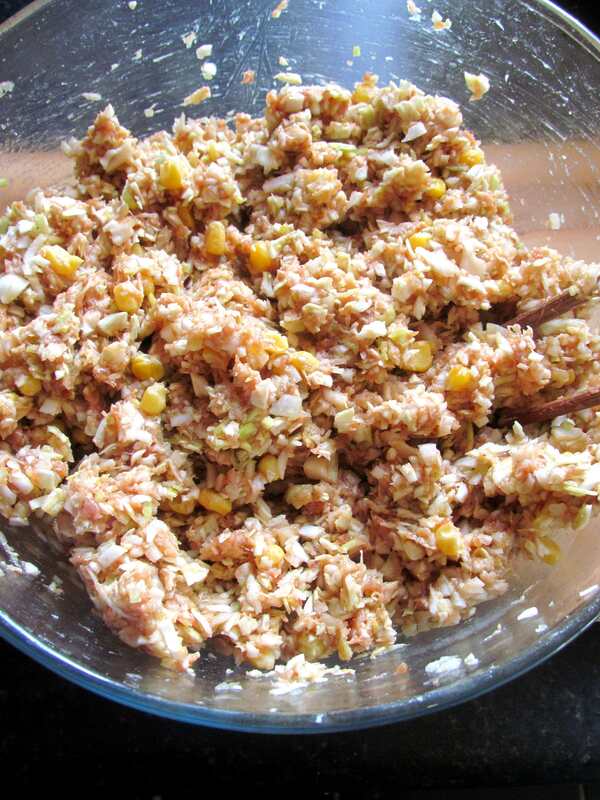 Put the leek, sweet heart cabbage and sweet corn into the bowl with the seasoned pork mince, mix well. 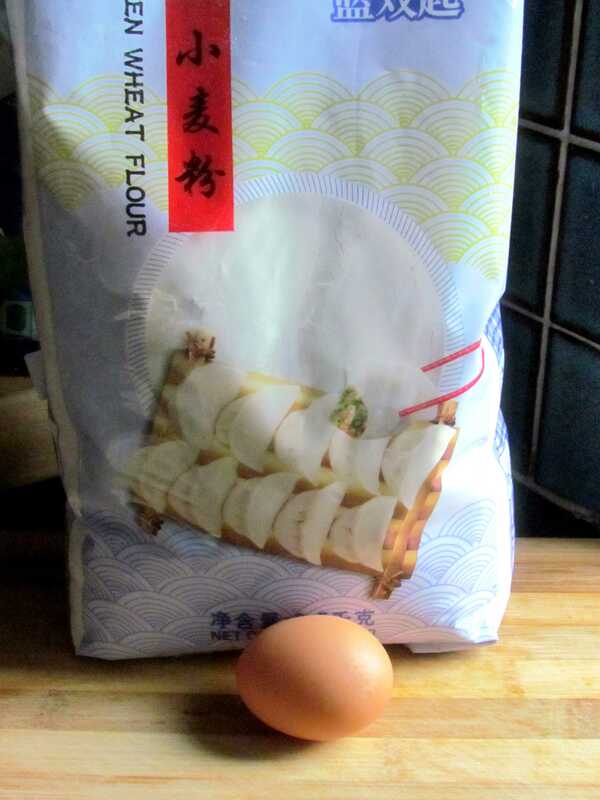 Take the dough out, place on a flat smooth surface with a thin layer of flour, knead until it becomes smooth. 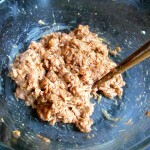 Divide the dough into three small parts evenly. Keep two in the bowl, cover with damp cloth. Knead the one that you are going to use into a long stick shape. Roll the stick to make it even and smooth. Cut it into 2cm diameter pieces. Squash them with your hand first, then use the rolling pin to roll it in to a flat disc about palm size. Make sure to roll from the edge to the center and always keep the center bit thicker than the edges. Place one skin in your hand, put a tbsp of filling in the center, flatten a little bit so the filling can lay on the skin evenly. Fold the skin in half and pinch the edge together. Be sure the edges are finely pinched close so the dumpling won’t open up during boiling. Repeat until finish all the skins and filling. Heat up a pot filled with 2/3 pot of water over strong heat. When the water starts boiling, put the dumplings in. 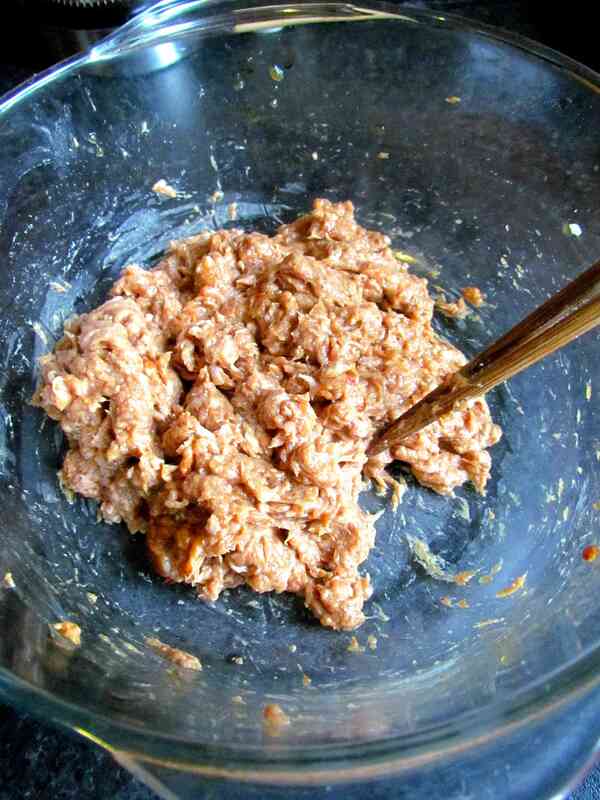 Carefully mix the water towards one direction while adding dumplings so they won’t stick on the bottom. Add 2/3 cup of cold water when it starts boiling. 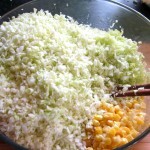 Repeat this for the next boil. When it boils for the third time, it is done. 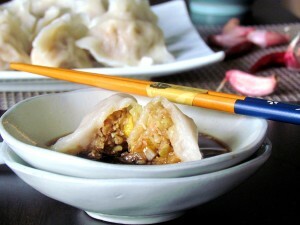 Take the dumpling out with a slotted spoon. 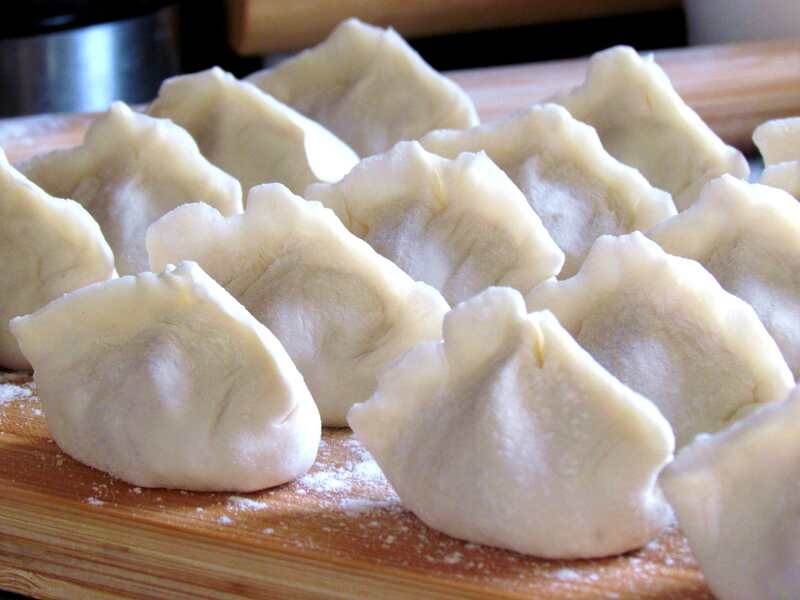 Cook 25 – 30 dumplings at one time, repeat until all the dumplings are cooked.